Barska has newly developed an 8x30 tactical binocular with a new red illuminating compass and range finding reticle. These Battalion military binoculars are multi functional and built to withstand use under extreme weather conditions. Barska binoculars are designed to withstand the most extreme of weather conditions. Barska Optics, a leading manufacture of sport optics and accessories has developed a new tactical military binocular with a range finding reticle. This new binocular features a compact 8x30 optical design with military specifications. In addition to the range finding reticle the right ocular has a built-in illuminated compass. With a shockproof rubber exterior these Barska binoculars are designed to withstand the most extreme of weather conditions. This new binocular design is part of the Barska Battalion series of unique marine / military optics. The new compass in these 8x30 military binocular is designed for use in the northern hemisphere but is available in a southern hemisphere model. This new compass feature is ideal for marine and scouting new terrain. The intergraded compass features a new illuminated red light for viewing the internal compass in low light conditions. An observer can be hidden away in the shade, totally concealed from its distant target and still have the ability to use the compass. When the binocular is in direct light the external illuminator can gather that light to illuminate the compass with out the use of the battery powered red light illuminator. The new range finding reticle in the 8x30 Battalion tactical binoculars is based on traditional military stands of determining the distance of an object or target. To use this reticle to find the distance of an object from the user one will need to estimate the height or width of the distant object. Then the user will need to measure how many lines the object encompasses when viewing the object with the binoculars reticle. A user can then take this information and plug it into a scale to find the estimated range. This method of range estimating can be used for target shooting, boating and surveying. Built to military specifications, the Barska Battalion binoculars can withstand the extreme heat of the desert and freezing cold of the arctic. O-ring sealed and dry nitrogen purged, these new tactical optics are completely waterproof and fogproof. The fully multi-coated optics of the barska battalion binocular delivers vivid, sharp, high quality images. The large high quality BAK-4 prisms produce high light transmission levels resulting in very bright, high contrast images. The Barska 8x30 Battalion military binoculars are built to endure a lifetime and are backed by the Barska limited lifetime warranty. BARSKA, with corporate offices, warehouse and distribution in La Verne, CA (Southern California), is a worldwide sport optics company with strong brand recognition in the optics industry. 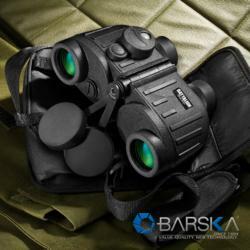 BARSKA offers an extensive line of precision sport optics products ranging from binoculars, riflescopes and spotting scopes to telescopes and laser sights. BARSKA is committed to delivering a superior quality product at an affordable price to our customers around the world. For more information, please call BARSKA at 1-909-445-8168, or visit them online at http://www.barska.com.